"I can't lose weight no matter what!" Sound familiar? You're doing everything right and your diet isn't working. You're not eating a lot, but you're still gaining weight. Is it your fault? Are you doing something wrong? Did you choose the wrong weight loss plan? 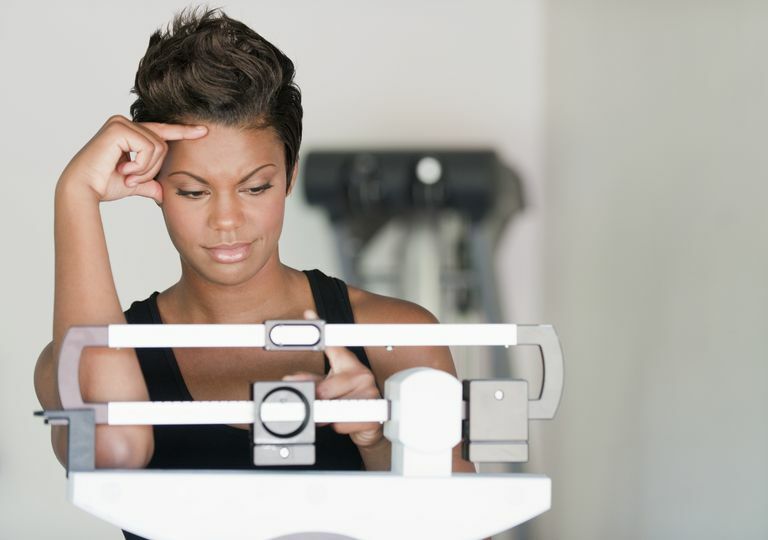 Are you simply meant to be overweight? The answer to all of those questions is probably no. No matter what diet you're on, no matter which weight loss expert you follow or workout program you practice, the secret to weight loss success is finding the right energy balance. You've got to burn more calories than you consume. But it's more complicated than it sounds because there are many factors that affect both your energy input (calories consumed) and your energy output (calories burned). There are many factors that affect your daily calorie intake. Any of them could be the reason that you can't lose weight, no matter what. Most likely, the problem is a combination of several factors. Evaluate each of them to see where you can make adjustments. Hunger Feeling hungry is the most obvious reason that we eat. But oddly, it is often not why we eat. If you find yourself eating too often or eating meals that are too big, you may be able to curb hunger with different food choices. Pick foods that are higher in fiber and build meals around protein. These strategies will help you to feel full longer. Boredom Mindless eating happens when we're bored and we need a distraction. It's one of the most common reasons we eat when we're not hungry. So what's the solution? Find another distraction (call a friend or go for a walk) or eliminate your access to food when you know you're going to be bored. Low-fat pitfalls Foods that are high in fat contain more calories. But many times these foods are more satisfying than low-fat foods that are high in sugar. So what's the better choice? If you can eat a small serving and be satisfied, choose the higher fat option. But if you'll be tempted to overeat, choose the lower fat, lower calorie option. Either way, exercise moderation and use portion control techniques even if you think a food is diet-friendly. Meal frequency Eating more often may help you to avoid binge eating at mealtime, but eating more often also increases your chances to consume too many calories. If you eat 2-3 large meals during the day and snack often because you're hungry, try 4-5 smaller, calorie-controlled meals. On the other hand, if you have a meal every three hours and you're not losing weight, you may be eating too often. Stress Many of us manage emotions with food. Food provides comfort, often gives us a sense of control and is a source of enjoyment. But those comfort calories add up. If you suspect that emotional eating is derailing your diet, consider healthy alternatives reduce stress. Take yoga, reach out to friends and family for support or find a behavioral health specialized who has expertise with food-related issues. Fatigue What do you do when your body begins to lag in the afternoon? I don't know about you, but I head to the kitchen. It's natural to look for energy (i.e. calories) when you need a quick pick-me-up. The problem is that when your activity level lags, the worse thing you can do is consume more calories. Before you grab your late afternoon snack, ask yourself if you are responding to hunger or fatigue. If you're tired, take a 15-minute nap. Portion size Almost all of us make portion size mistakes all day long. If your diet isn't working, get a small digital scale and start to measure each portion of food. Chances are good that you are eating more than a single serving of many foods, like cereal, bread or popcorn. Food choices Many dieters fall victim to the health halo effect. That is, they consume too many calories from of foods that they think are healthy. Avocados, for example, are full of healthy fat. But there are too many calories in an avocado, so you need to eat them in moderation. Remember, any food that is consumed in excess will cause weight gain - no matter how healthy it is. Workouts that are too hard Believe it or not, but your workout might be the reason that you're not losing weight. Some programs like CrossFit could actually be harmful to your weight loss program if it causes you to take too much time off or worse, causes injury. Try to get some physical activity every day. That means you should schedule easy and moderate workouts along with the high-intensity fat burners. Non-exercise activity level. If your fat-burning Tabata workout exhausts you to the point that you spend the rest of the day on the couch, then you are not benefiting from NEAT. Non-exercise activity thermogenesis can account for up to 2000 calories burned per day. Make sure you keep moving all day long. Take the stairs, carry your own groceries, stand while you chat on the phone. It all adds up. Stress-induced laziness. Some people react to stress by moving. But others take to the couch in times of trouble. If you are going through a difficult time, give yourself permission to rest. But try to incorporate easy workouts with a friend to gain support and stay active. Fatigue. The simple act of dieting can cause stress and fatigue. Even if your weight loss program is not at fault, daily exhaustion is likely to hinder your workouts and your NEAT. Learn how to sleep better for weight loss. Take simple steps like charging your phone in the kitchen or changing the lighting in your bedroom to get a better night's sleep. Physical factors. Medical conditions, like thyroid disease, can affect your daily caloric expenditure. Factors such as age and genetics also play a role in the number of calories you burn. Talk to your doctor about factors that affect your metabolism. Sometimes there are things you can do to give it a boost. Body composition. Muscle burns more calories than fat. To increase your calorie burn all day, boost your lean muscle mass. Eat enough protein to fuel your weekends and build strong muscle. Then complete regular strength training workouts at home or at the gym to get lean and buff. Your job. Occupations that require you to sit at a desk will decrease your daily energy output. You're not likely to change jobs to lose weight, but you may be able to make simple changes in your office to increase your daily caloric burn. Stand while you type, skip the elevator and walk the stairs, turn sit-down meetings into walking meetings. Some companies are even installing treadmill desks to help workers increase their daily activity level and improve health. Exercise habits. The way you schedule your workouts can make a difference in the number of calories you burn during each one. For example, if you schedule a long run on a day after a tough boot camp workout, you may be too tired during the run to gain a real benefit. Create a balanced exercise program to burn calories with consistent but reasonable workouts. Exercise-induced binge eating. Believe it or not, one of the most common mistakes that dieters make is eating too much and justifying the episode with exercise. In fact, it is not uncommon for new marathon runners to gain weight for this reason. Make sure you are properly fueled for your workouts so that you don't binge when you're done. Trying to find the reason your diet isn't working can be a pain. But your diet isn't doomed to fail. One of one of these factors is contributing to your weight loss woes, and you can address it if you want to slim down. Get creative and try different tweaks. And don't forget to reach out to friends and family for support and motivation.